One very touristy, but still not-to-be-missed monument is the Citadel of Carcassonne. 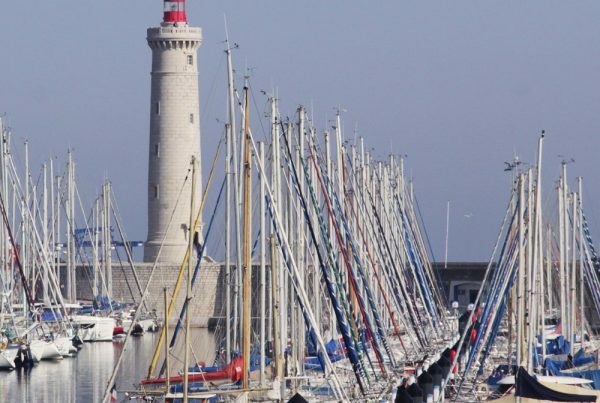 It is even in the top five most visited monuments in the whole of France! No wonder the well-preserved citadel- with its Gallo-Roman military architecture, 3 kilometres of ramparts, 52 towers and 4 gates- attracts so many people. 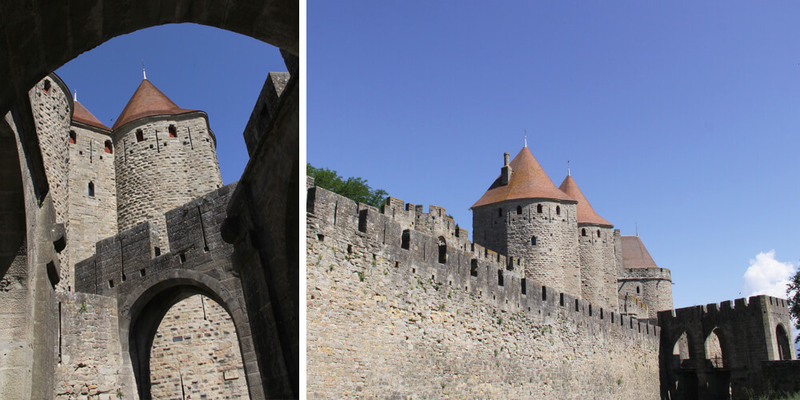 Here’s part 1 of 2 posts about beautiful Carcassonne (click here for part 2). In fact, there are two medieval cities. On the south side of the River Aude you will find the Bastide, built in the thirteenth century. And on the north side of the river is the citadel, called Cité in French, of Carcassonne. 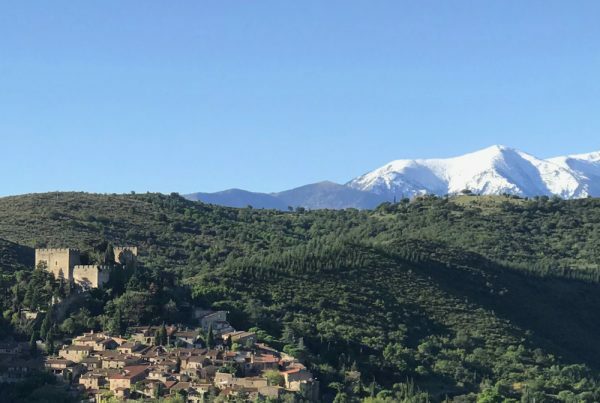 The citadel is lovely, perched on a hilltop, with great views of the Bastide and the region. You can enter La Cité by two gates: La Porte Narbonnaise and La Porte d’Aude. I usually take the first one, which you are automatically directed to when you follow the signs from the motorway. When entering La Cité by La Porte Narbonnaise, you will meet “Dame Carcas”. 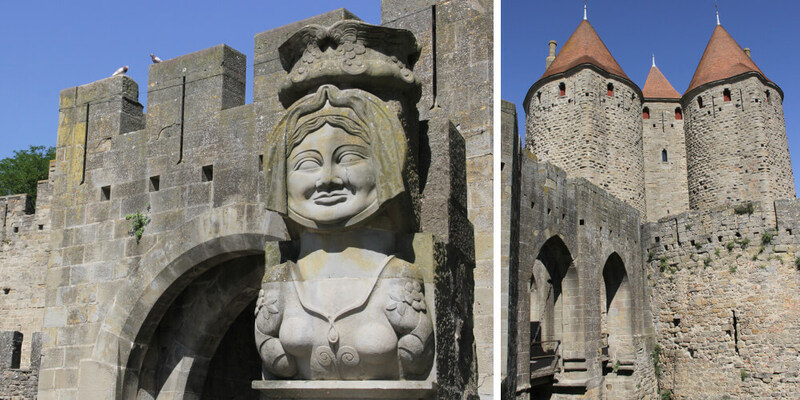 A replica of her statue welcomes you right at the entrance of La Porte Narbonnaise, while the castle safely keeps the actual 16th-century statue. According to the legend, the Saracen took over the citadel of Carcassonne in the 16th century. As their king was killed, his wife “Dame Carcas” took his place. Of course, Emperor Charlemagne wanted to reconquer the citadel, so he held it under siege for five years. The last defenders were outnumbered and hungry. 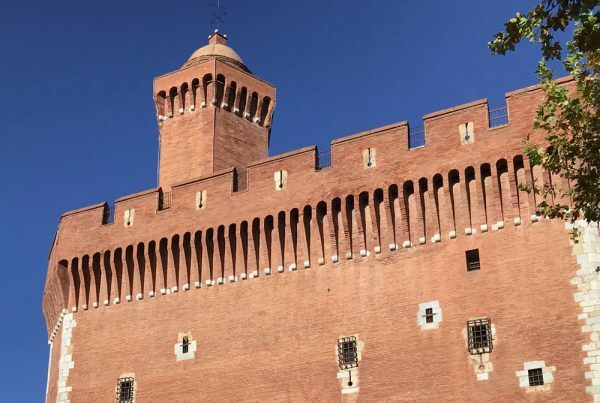 However, to give the besiegers the impression that there were still lots of them with plenty of food, Dame Carcas fed the last little pig with a handful of wheat and threw the pig from the highest tower of the city wall (harsh times back then…). Seeing this well-fed pig, made Charlemagne think. If the Saracen could still feed their pigs, there was clearly enough food. Conclusion: Charlemagne decided to call it a day. To celebrate this victory, Dame Carcas let the bells chime, or in French: “Carcas sonne”. The best time to visit Carcassonne is Spring or Autumn, as it does get quite crowded in Summer. This time of year you can still walk around the town peacefully. I have visited Carcassonne numerous times, but I had never walked around the citadel before. 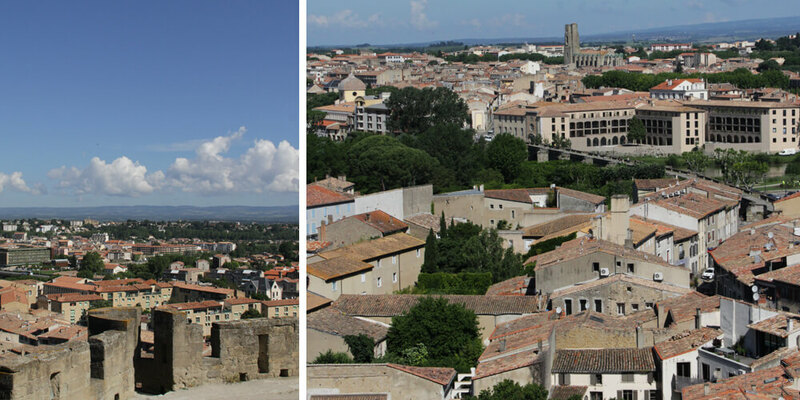 Carcassonne is a perfect example of a fortified medieval city. An important one, as it has two city walls for extra protection. As the weather was perfect, not too hot with a bright blue sky, I enjoyed a spectacular view of “La Bastida”, the other medieval part of Carcassonne. 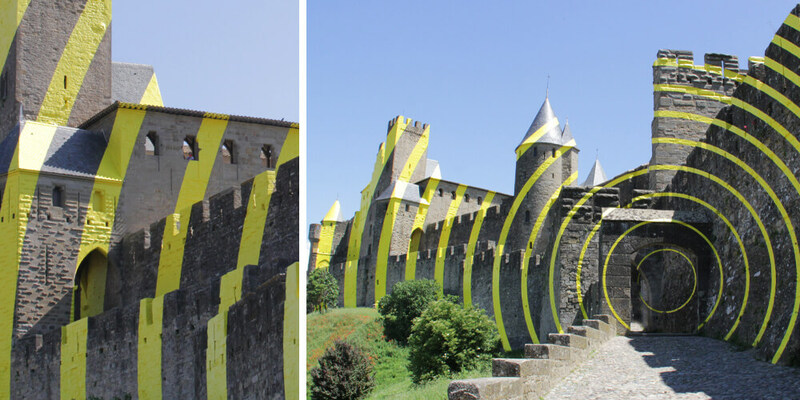 But the real reason for my visit to Carcassonne was the artwork “Concentriques Excentriques”, created in 2018 by Felice Varini to celebrate the town’s 20th anniversary as Unesco World Heritage. This gigantic piece of art was painted on the actual citadel itself. Entering La Cité from the Porte d’Aude, I noticed strange yellow lines marked out on the rampart and towers. Once standing in front of the gate, the yellow lines merged to form 15 circles. 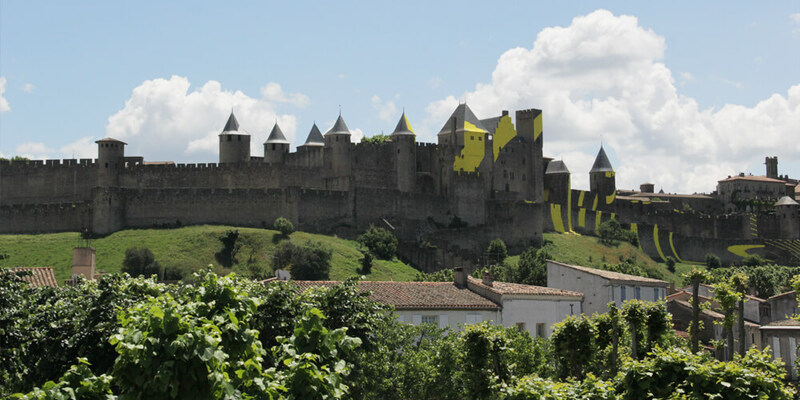 This work of art has been a hot topic for discussion in Carcassonne and the surrounding areas, as it seemed that you either loved it or hated it. I belonged in the first camp: I absolutely loved it. No worries if you don’t like the yellow stripes on the historic site though, they were removed at the end of September 2018. You can visit the citadel, or la Cité, of Carcassonne year-round. Entrance to the citadel itself is free; only the castle has an entrance fee. Summer can be jam-packed, the best time to visit is in Spring and Autumn. If you enter the citadel by the Nabonnaise gate, signs will direct you to a paid parking lot ( P1 at Chemin de Montlegun). Just follow the signs to the Cité. 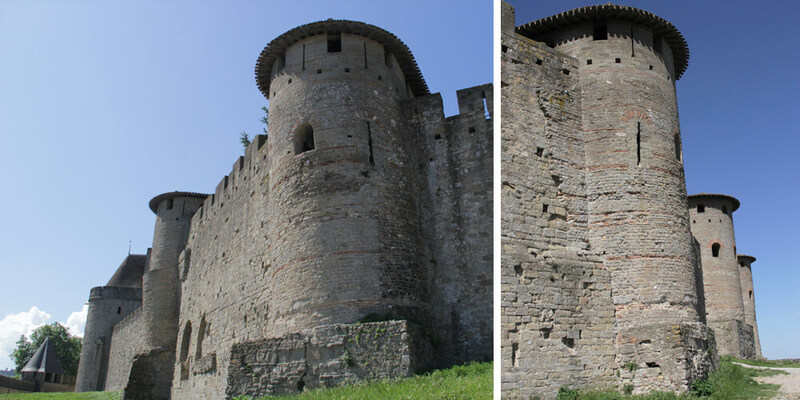 If you want to enter the citadel by the Aude gate, follow the signs to Carcassonne centre and then P2 (Rue Dujardin Beaumetz), which is also paid.